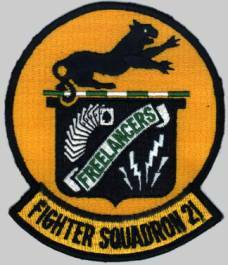 VF-21 Freelancers was the third US Navy fighter squadron to be designated VF-21. 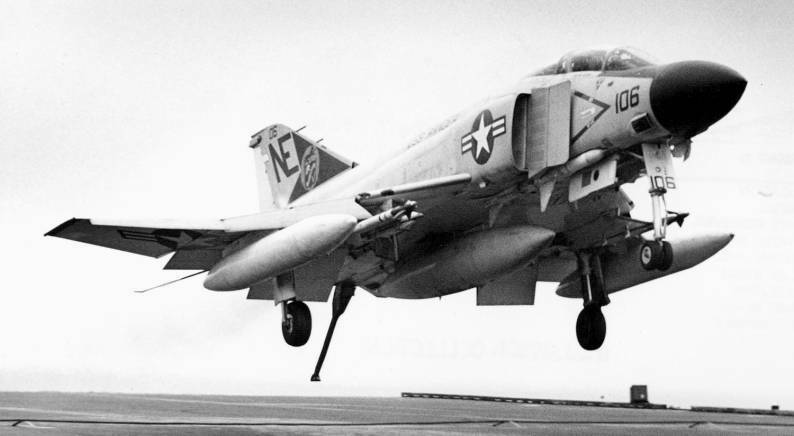 The first was VGS-11, which was established in 1942, redesignated VF-21 in 1944 and disestablished in 1945. 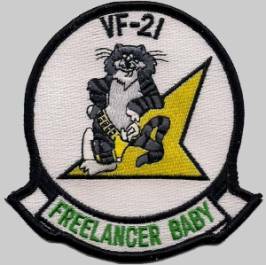 The second VF-21 was established in 1945 as VF-74A and became VF-21 in 1948. 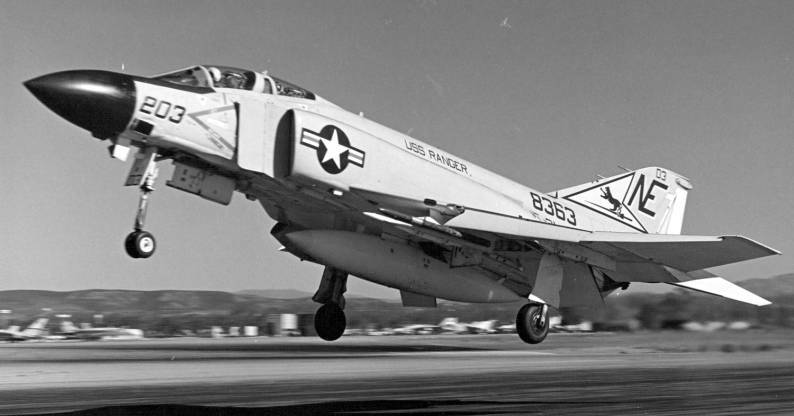 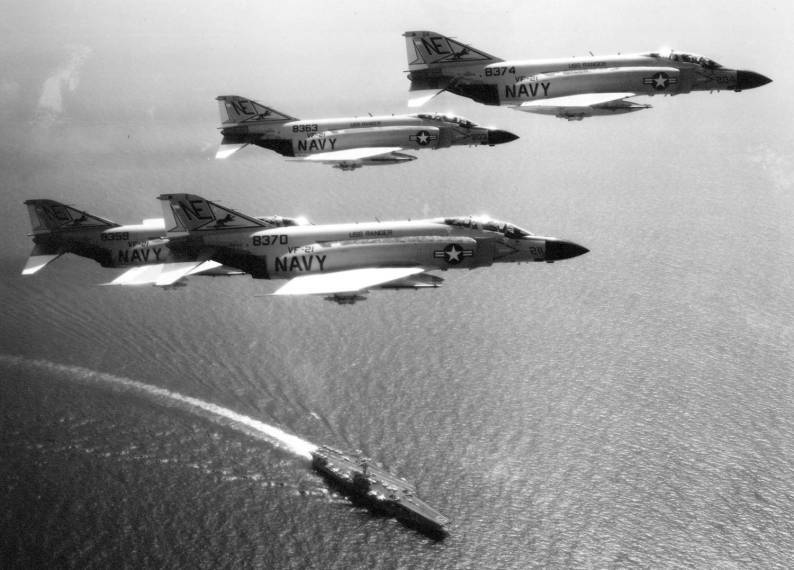 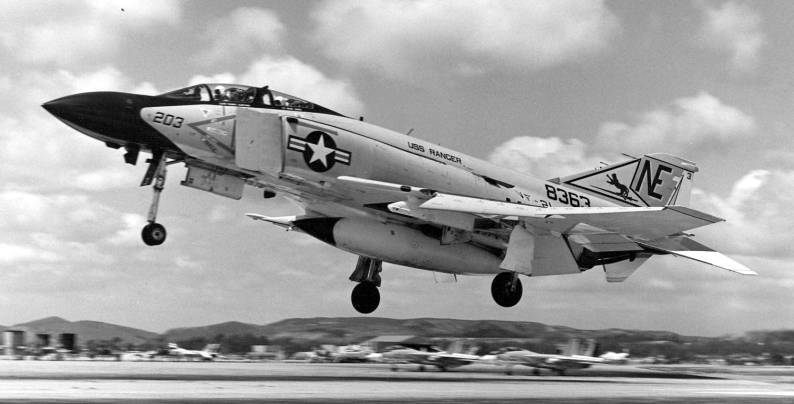 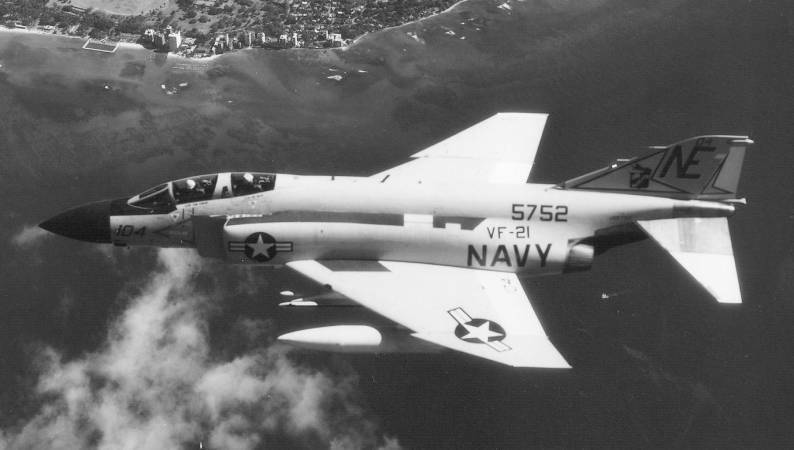 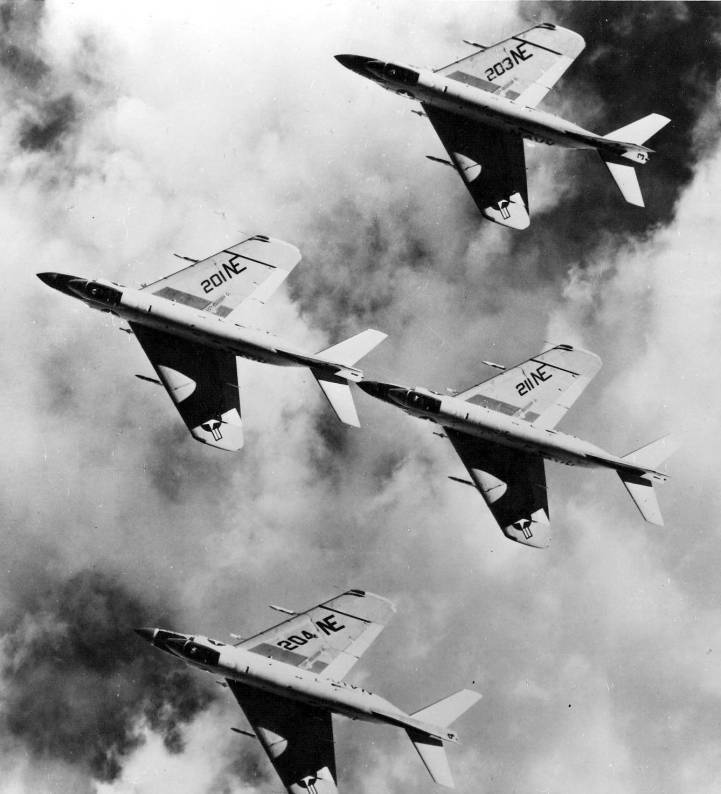 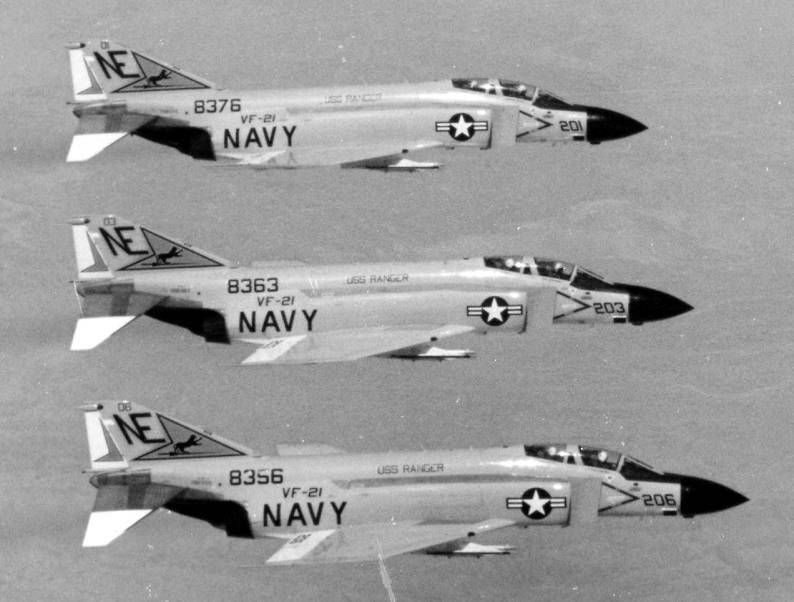 This squadron became attack squadron VA-43 Challengers on 1 July 1959, and VF-43 in 1973. 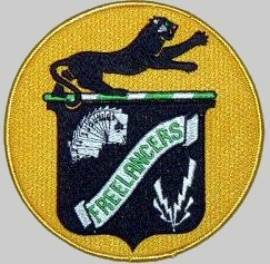 It was disestablished in 1994. 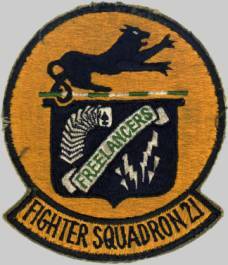 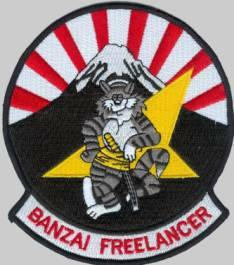 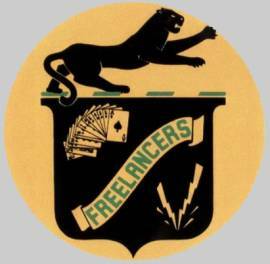 VF-21 Freelancers was first established in 1944 as VF-81. 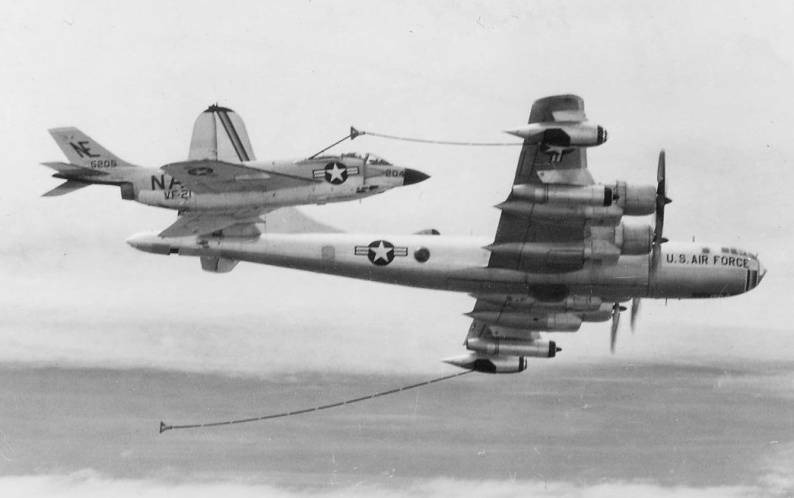 In 1946 it became VF-13A, in 1948 VF-131. 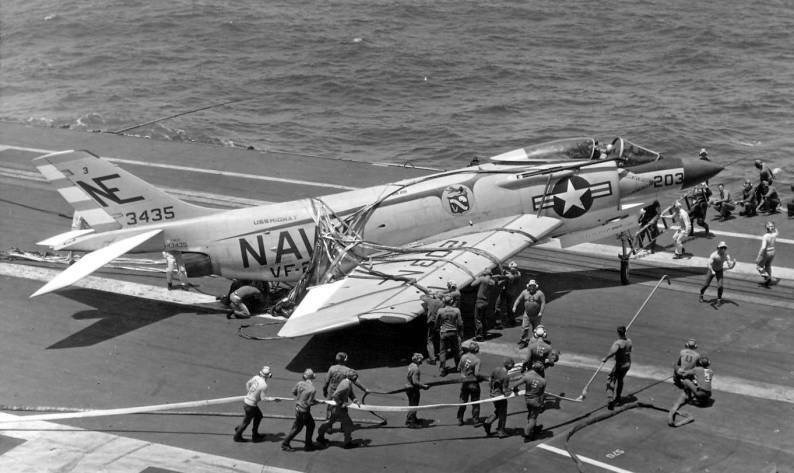 In 1950 it was again redesignated VF-64. 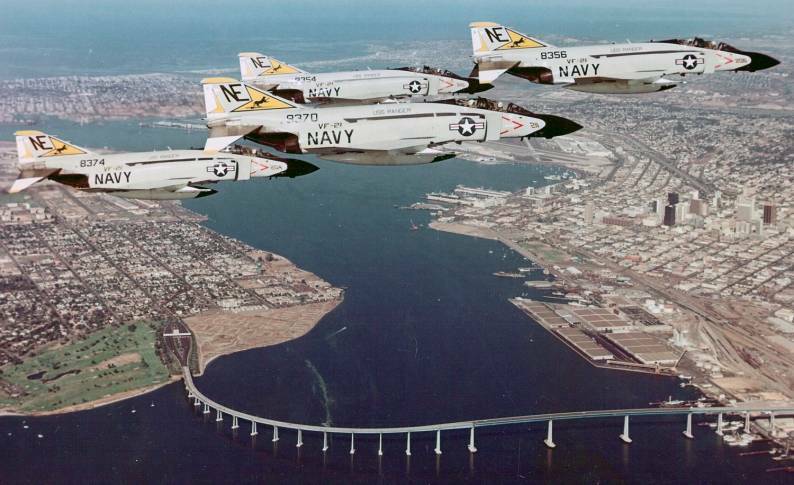 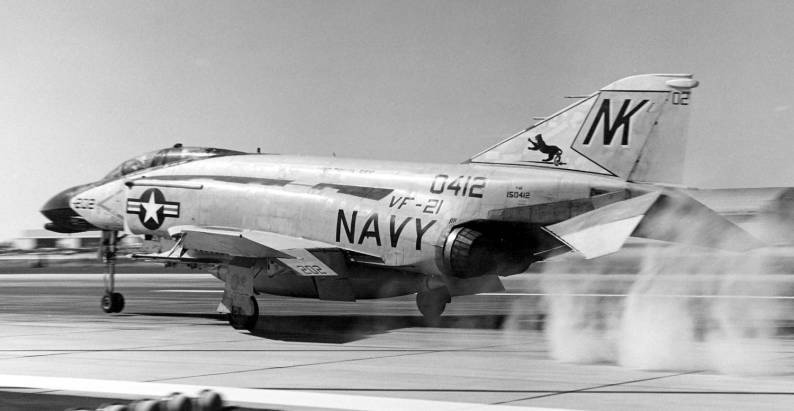 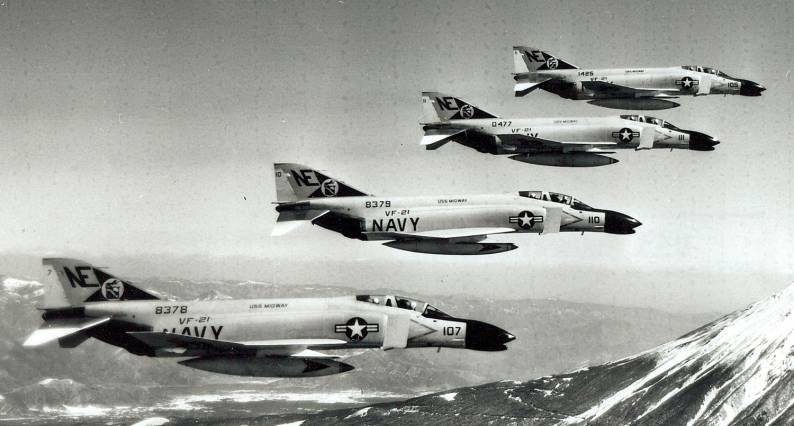 The squadron was then reformed at Alameda, California on 1 July 1959 when VF-64 was redesignated as part of the United States Navy to “tidy-up” the Carrier Air Groups. 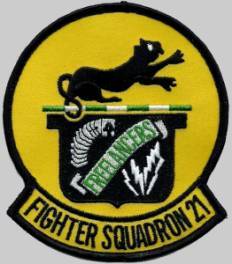 Operational control was given to Carrier Air Group 2 and VF-21 was part of Carrier Air Group 2 for the next 20 years. 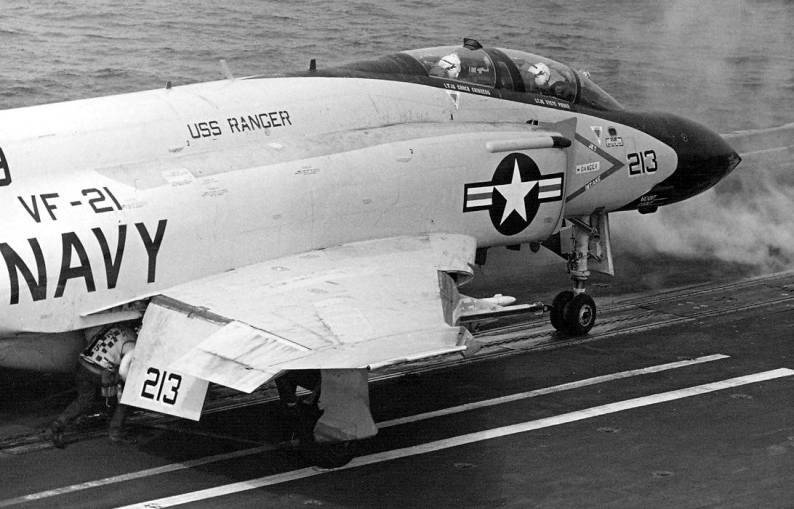 The VF-21 embarked on its major deployment with the McDonnell F3H-2 Demon on USS Midway (CV-41) in mid-1958. 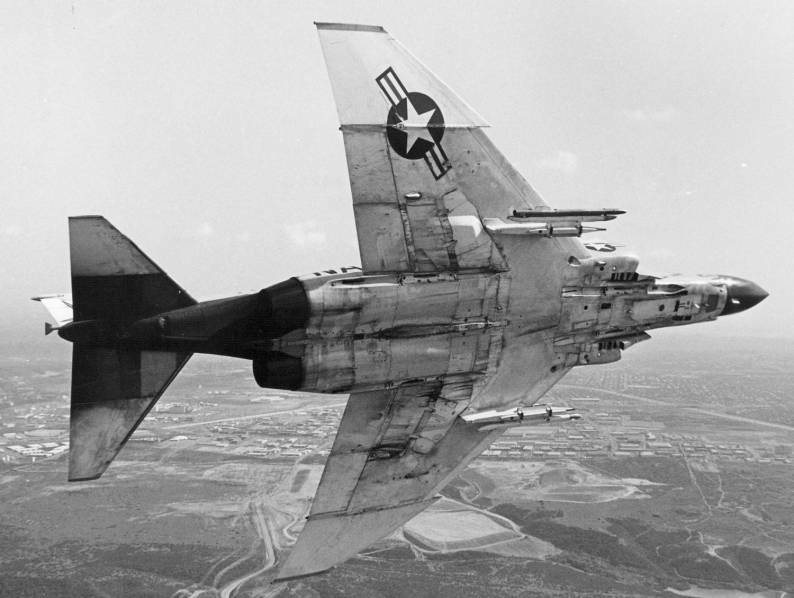 In June 1961 VF-21 was reassigned to Miramar. 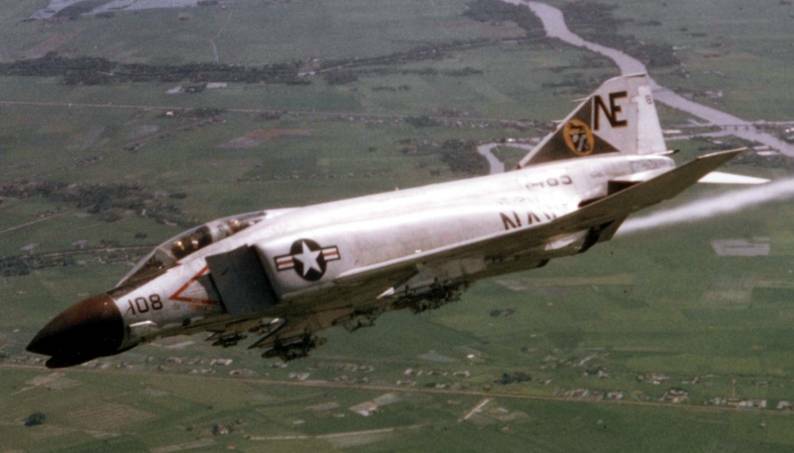 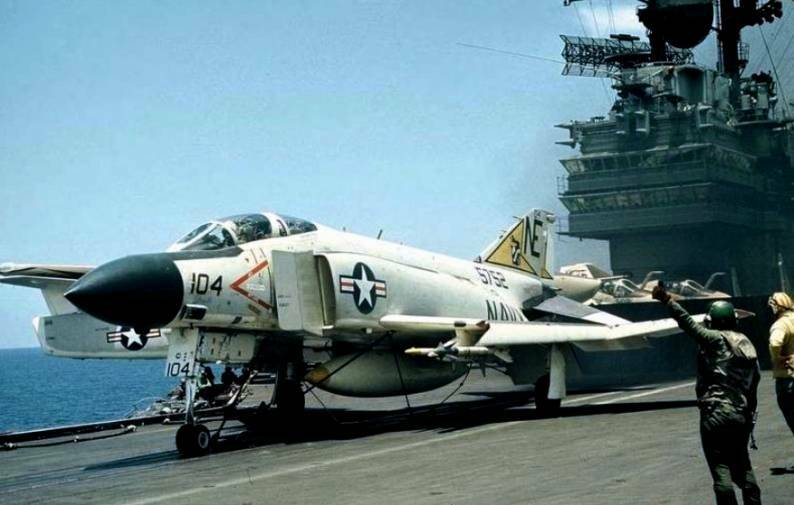 It was here VF-21 transitioned to the F-4 Phantom in 1963 and between November of that year to March 1964 it would be the last peace-time cruise for the next 10 years. 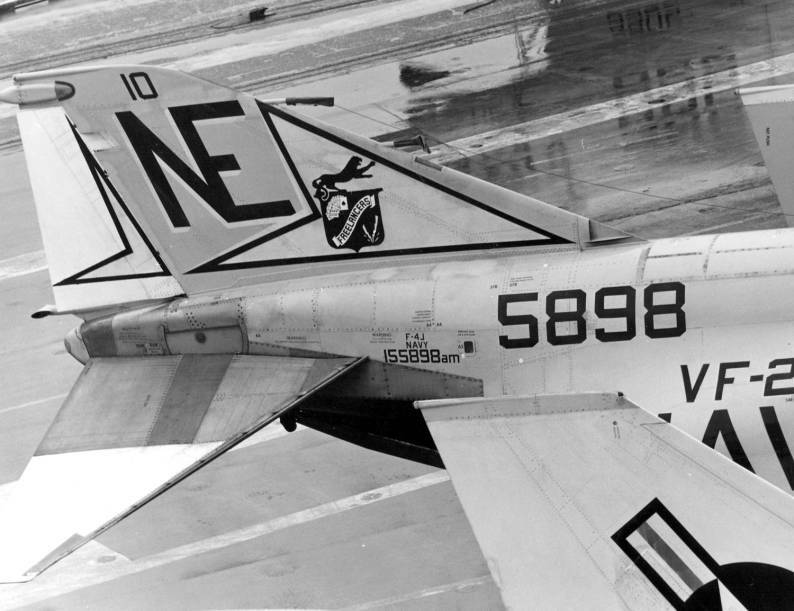 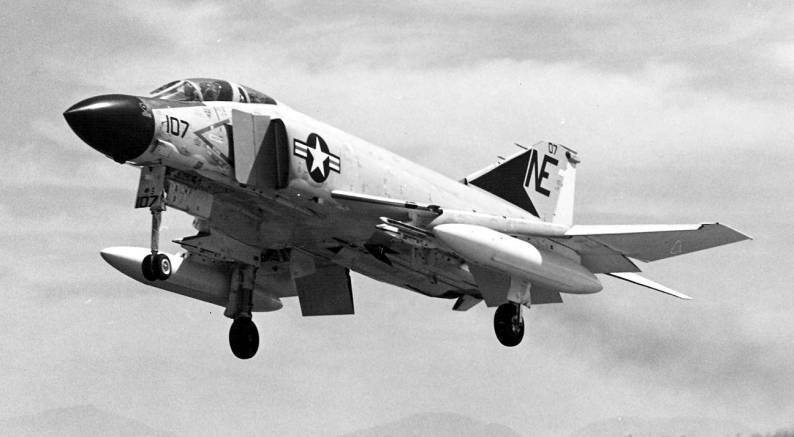 VF-21 returned to sea in March 1965 and were bound for the Vietnam war and VF-21's first aerial victories would be the first confirmed kills achieved by a U.S. Navy fighter squadron during the course of that long conflict. 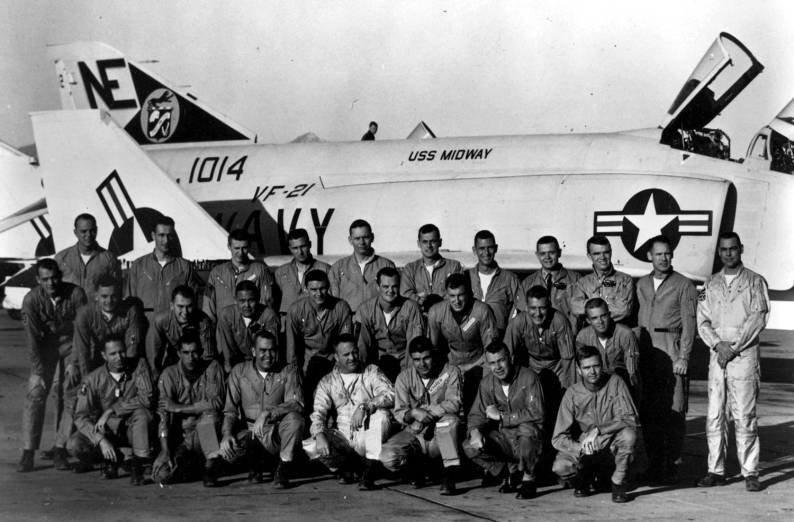 On June 17, 1965 Commander Louis Page and Lieutenant John Smith destroyed a MiG-17 with an AIM-7 Sparrow and moments later Lieutenant Jack Batson, jr and Lieutenant Commander Robert Doremus destroyed another MiG-17 with an Sparrow missile. 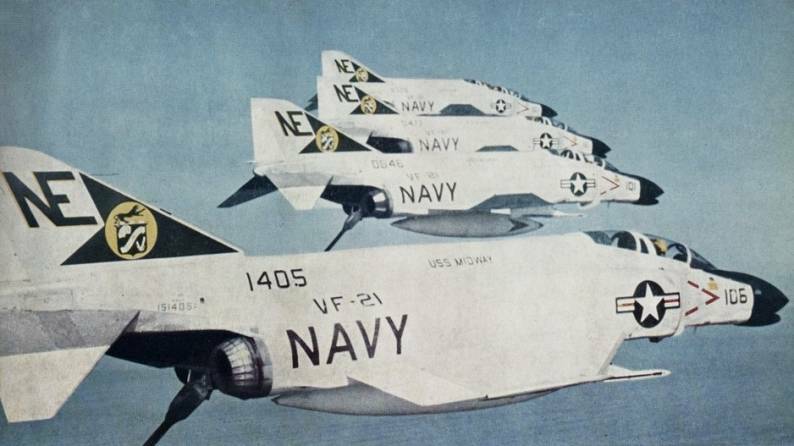 VF-21 made six further deployments to the war zone aboard the USS Coral Sea (CV-43) and USS Ranger (CVA-61) between 1966 and 1973. 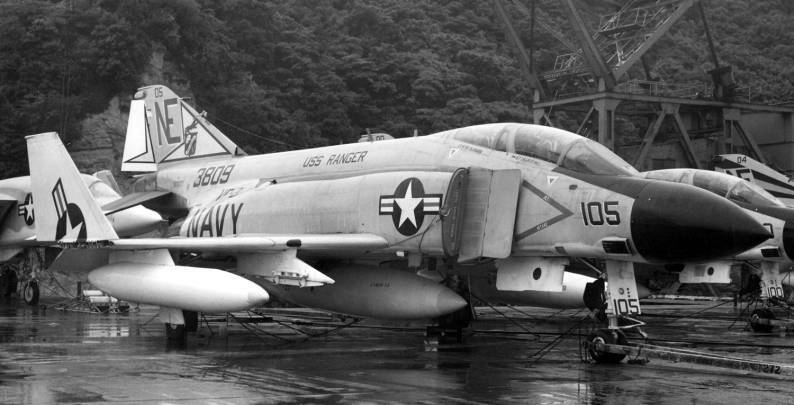 In 1968 VF-21 upgraded to the F-4J and continued to operate this model until 1979. 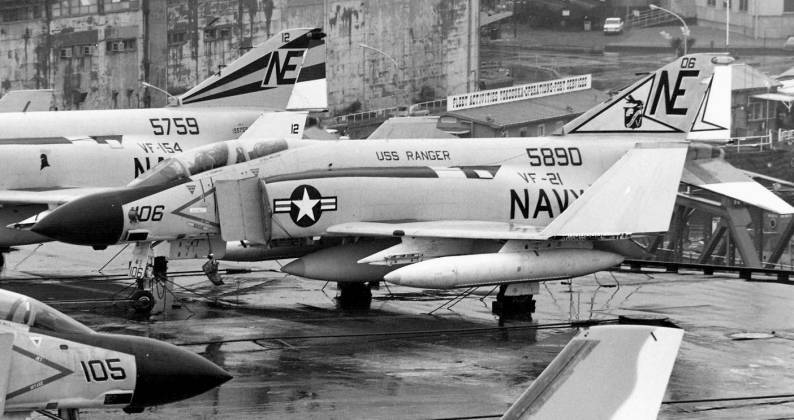 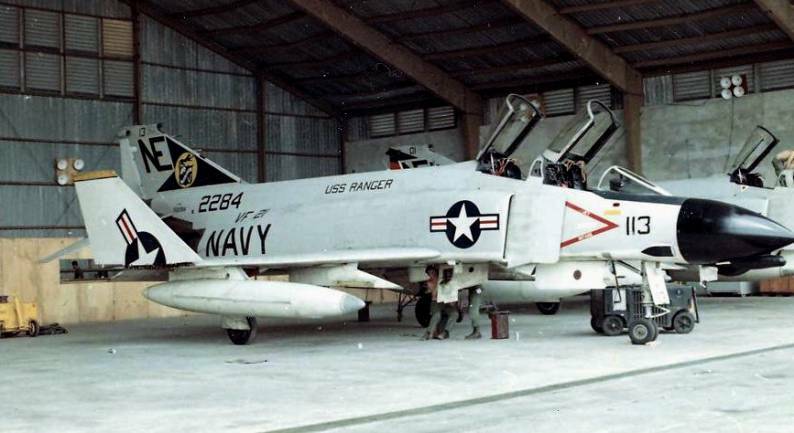 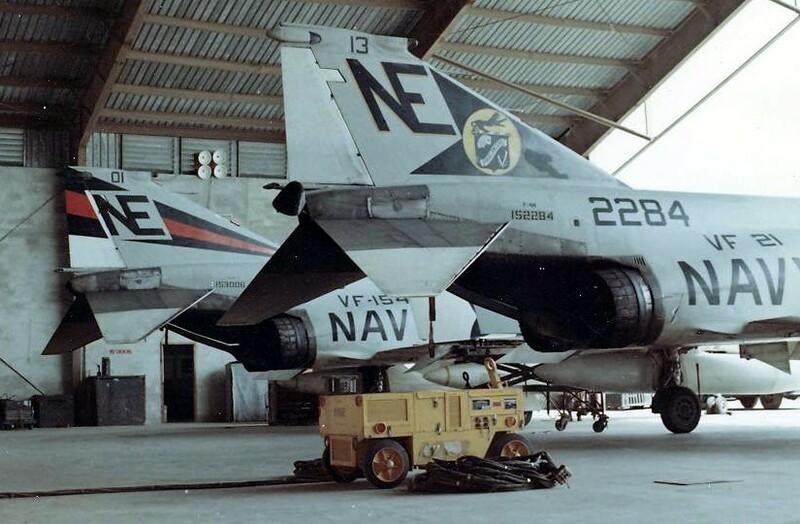 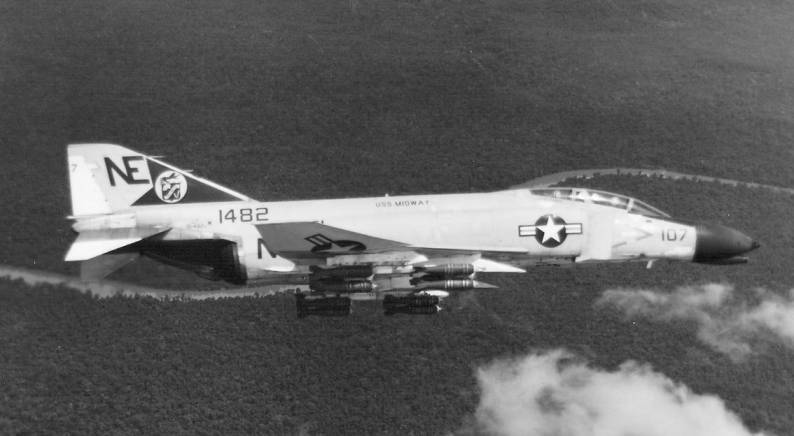 Some important changes were faced by VF-21 in the end of the 1970s. 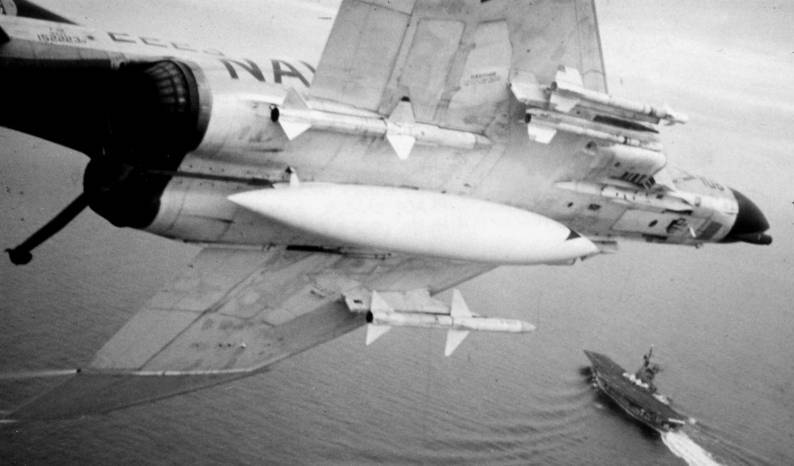 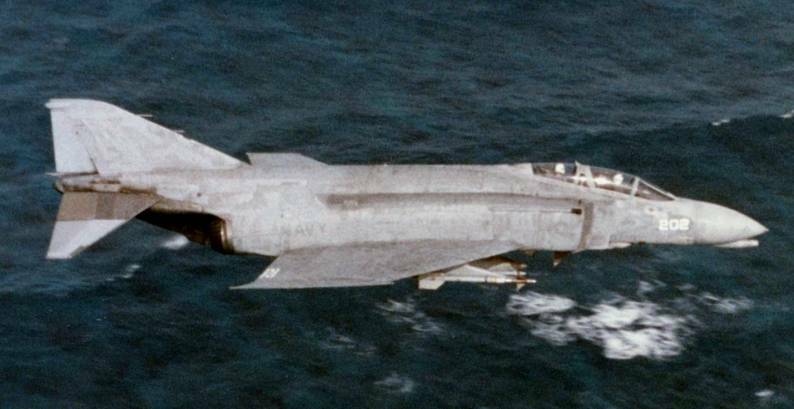 By December 1979 VF-21 was re-equipped with the F-4S, but it was decided that the F-4S was not ideally suited to be used from the USS Coral Sea which VF-21 would deploy on the next cruise, and instead VF-21 deployed with the less effective F-4N which it was decided better suited for the Coral Sea. 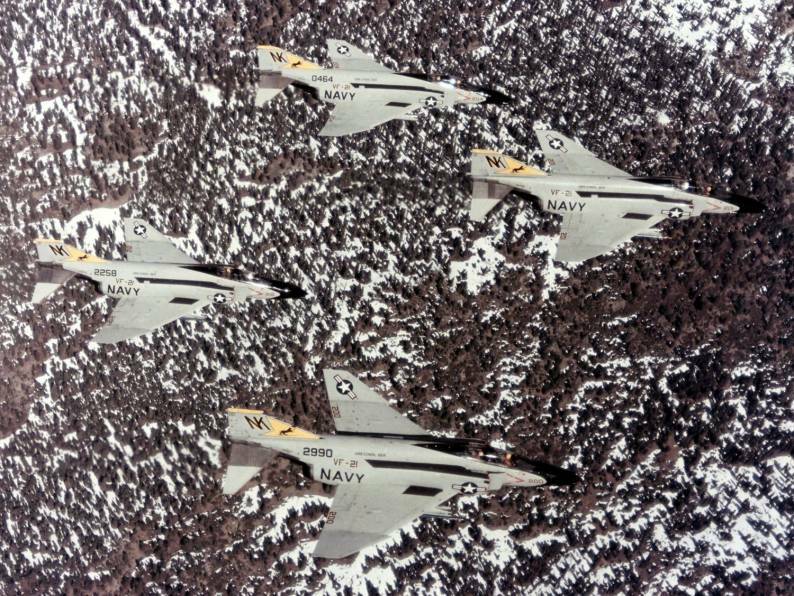 CVW-14 assigned control over VF-21 and the squadron returned to sea in 1981, spending seven months in the Pacific and the Indian Ocean. 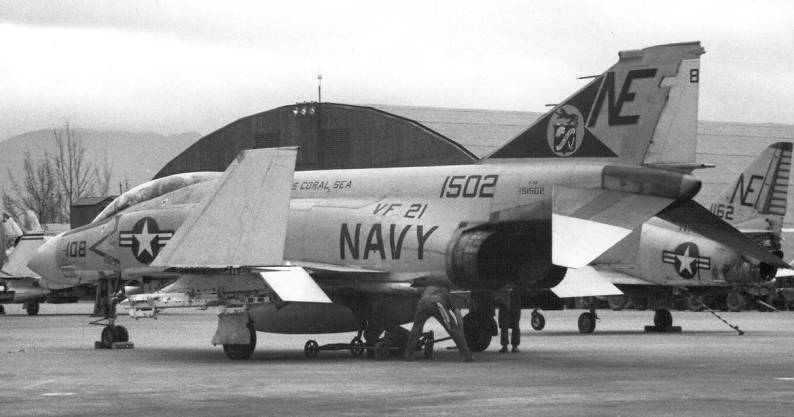 A new deployment followed in 1983, where VF-21 was one of several squadrons that took part in the Coral Sea´s world cruise of that year which culminated in a change of fleet assignment to conduct operations in the Atlantic Ocean and the Mediterranean Sea. 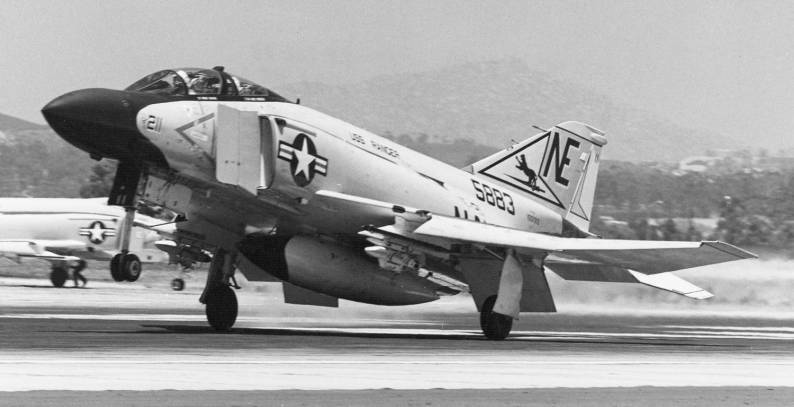 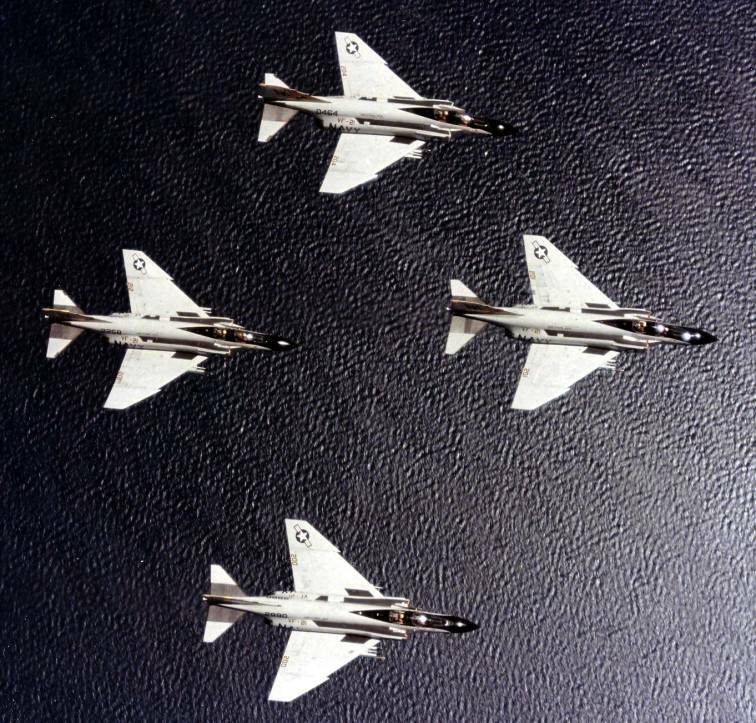 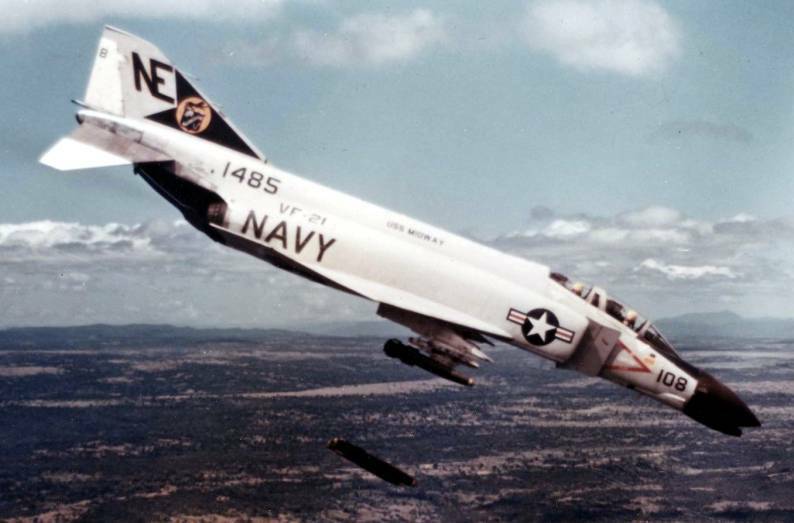 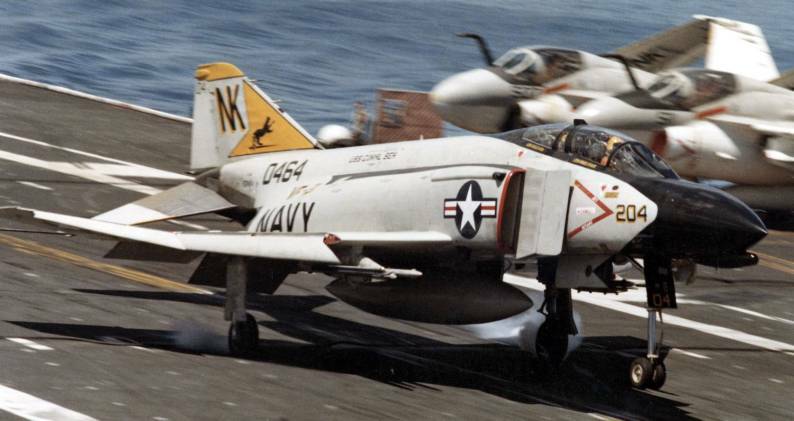 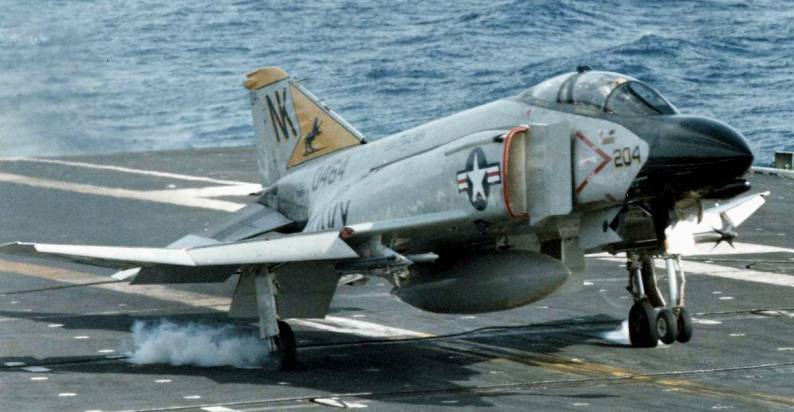 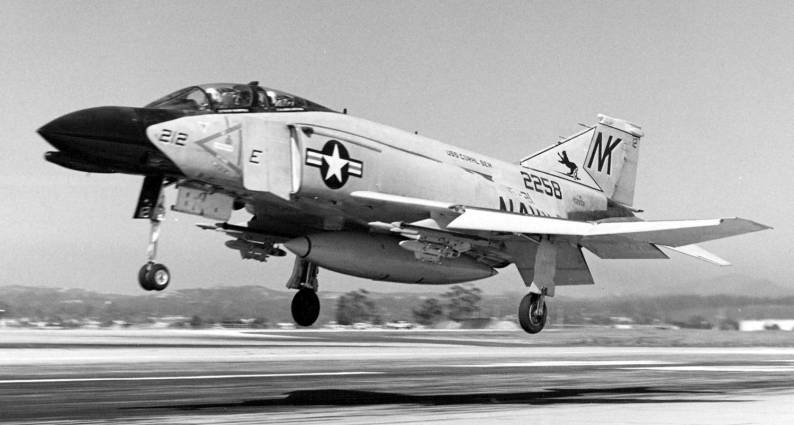 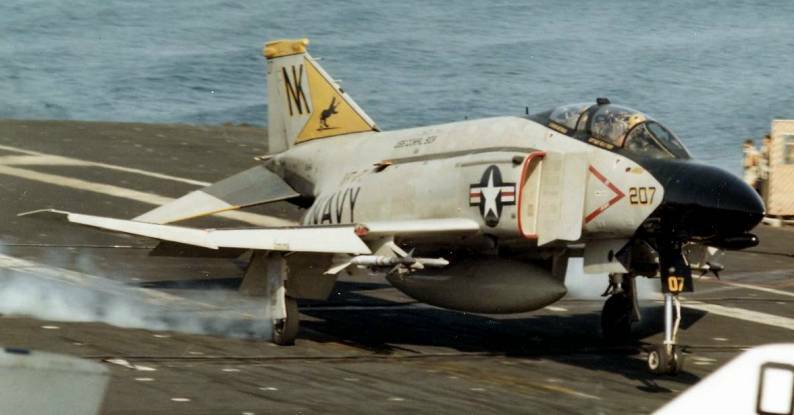 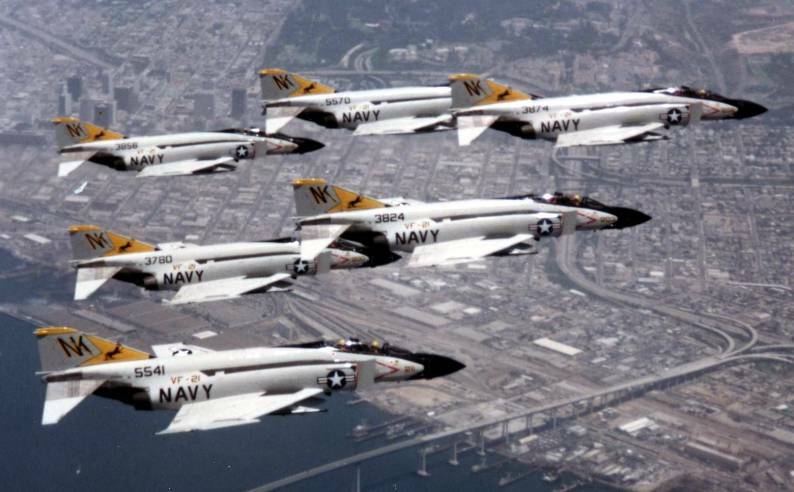 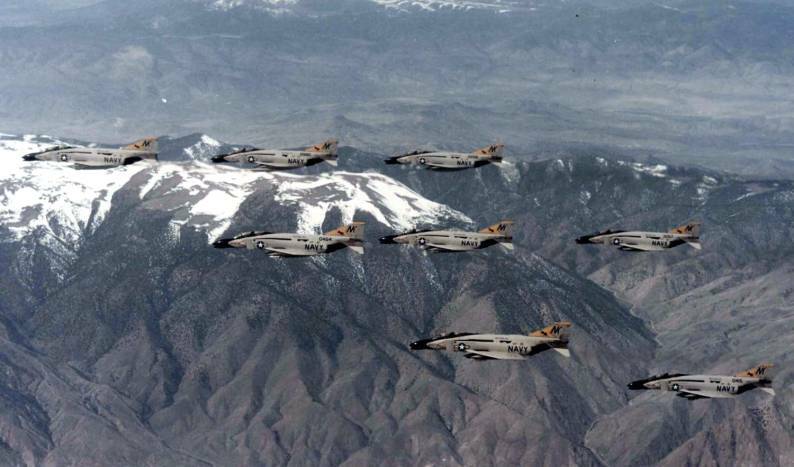 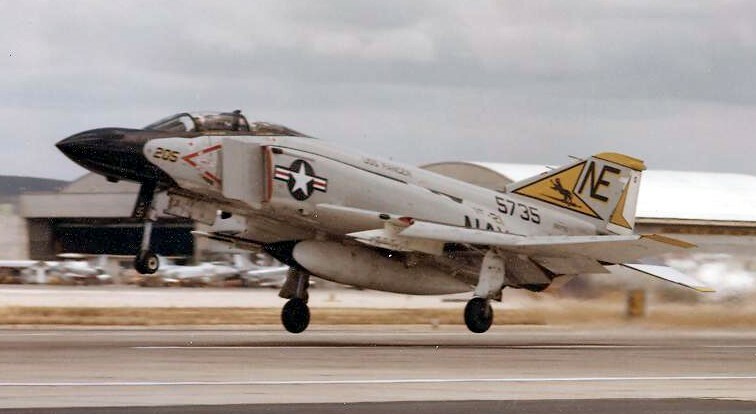 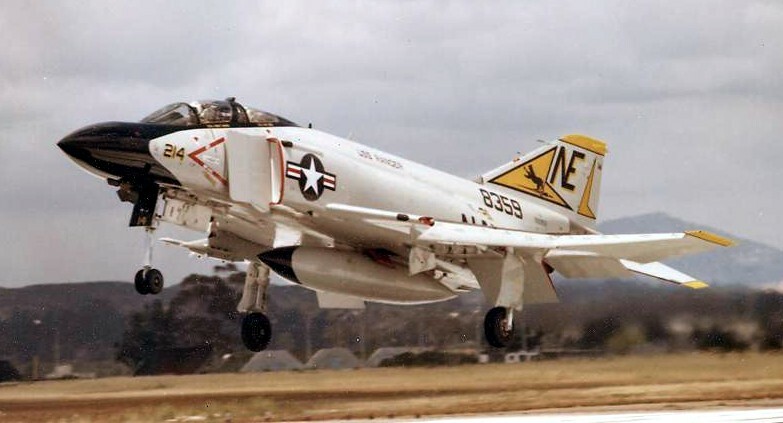 The 1983 tour was also noteworthy in that it marked the last occasion on which US Navy 'Phantoms' were to deploy from a US base, VF-21 joining with sister squadron (VF-154, the Black Knights) in a nostalgic and impressive final "fly-in" to Miramar in mid-September. 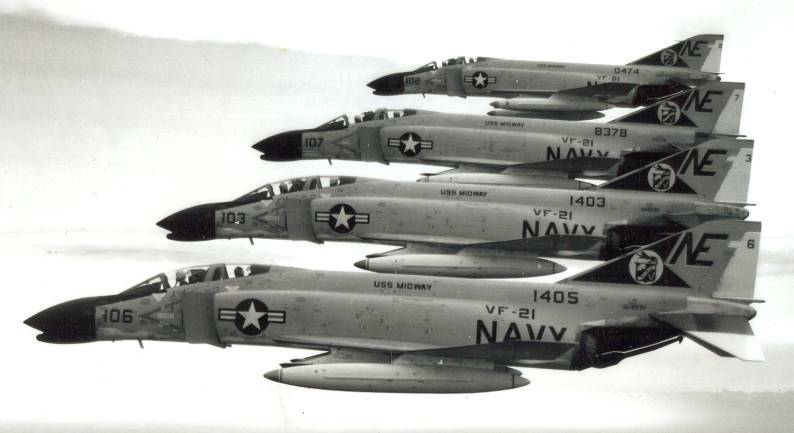 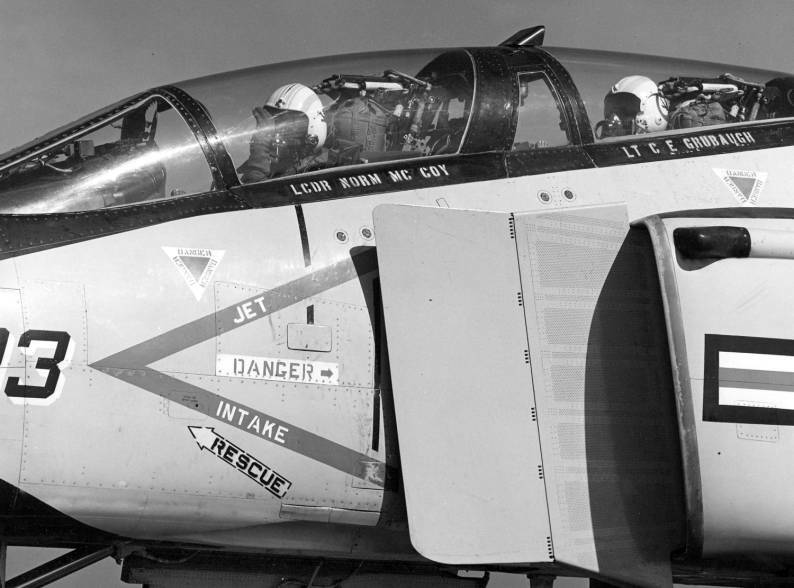 Although this was not the end of the F-4, some aircraft lingered on until November 4, VF-21 hosted a ceremony which honored "the end of an era" for the F-4 in fleet operations, VF-21 and VF-154 were the last US based squadrons to fly F-4s (although there were two forward deployed squadrons continued to operate the F-4). 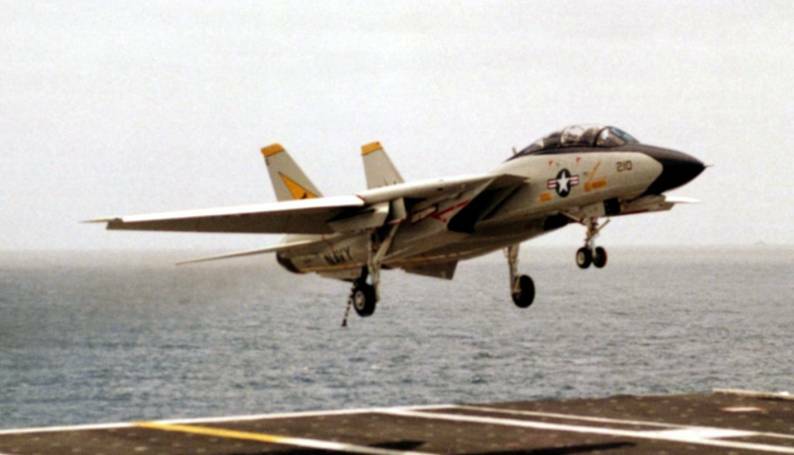 VF-21 now transitioned to the F-14 Tomcat, the process was managed by VF-124 and it was not until later half of 1984 that VF-21 was declared fully operational, the first cruise was with CVW-14 aboard USS Constellation (CV-64) in early 1985. 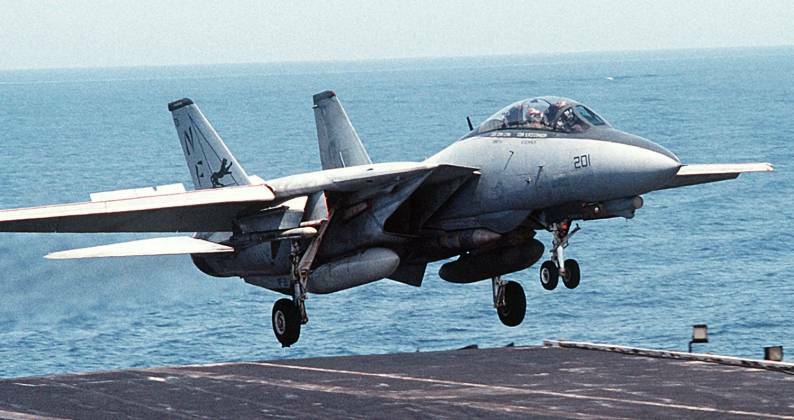 A significant cruise for VF-21, this cruise was more memorable as the debut of the F/A-18 Hornet. 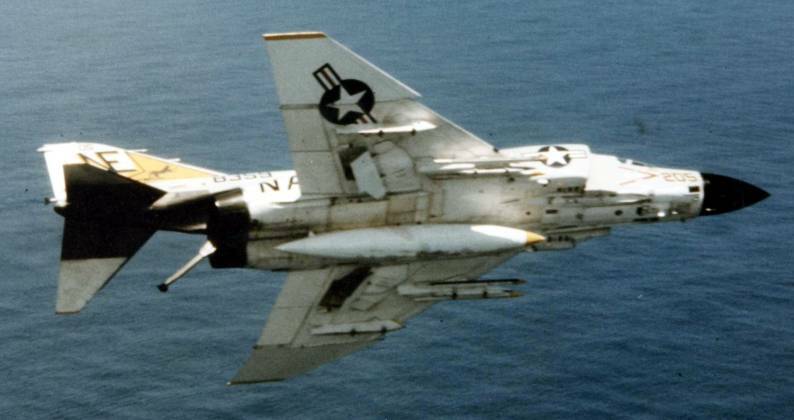 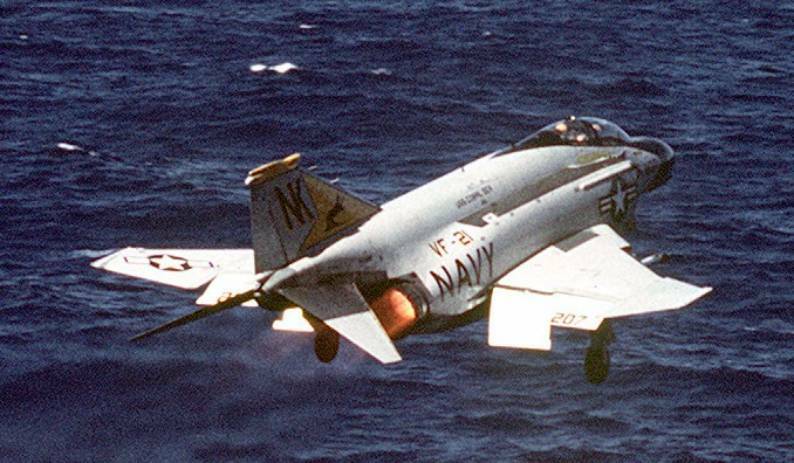 In 1987, VF-21 launched AIM-7 Sparrow missiles against an Iranian F-4 that had engaged a P-3 Orion in the Persian Gulf. 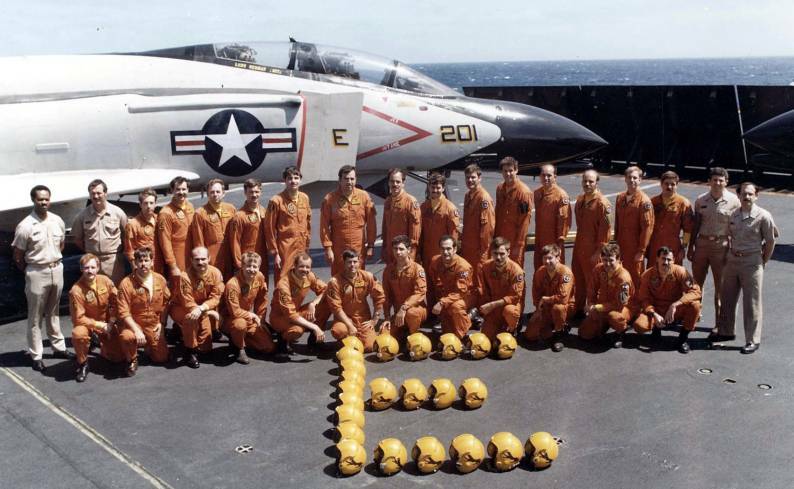 A number of cruises followed until 1990 when the squadron, with the rest of its air wing, moved to the USS Independence (CV-62). 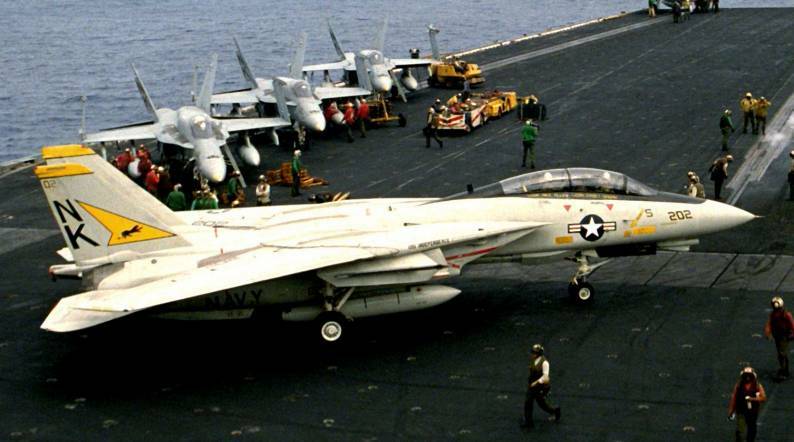 The carrier was the first to reach the Persian Gulf in response to Iraq’s invasion of Kuwait in August 1990. 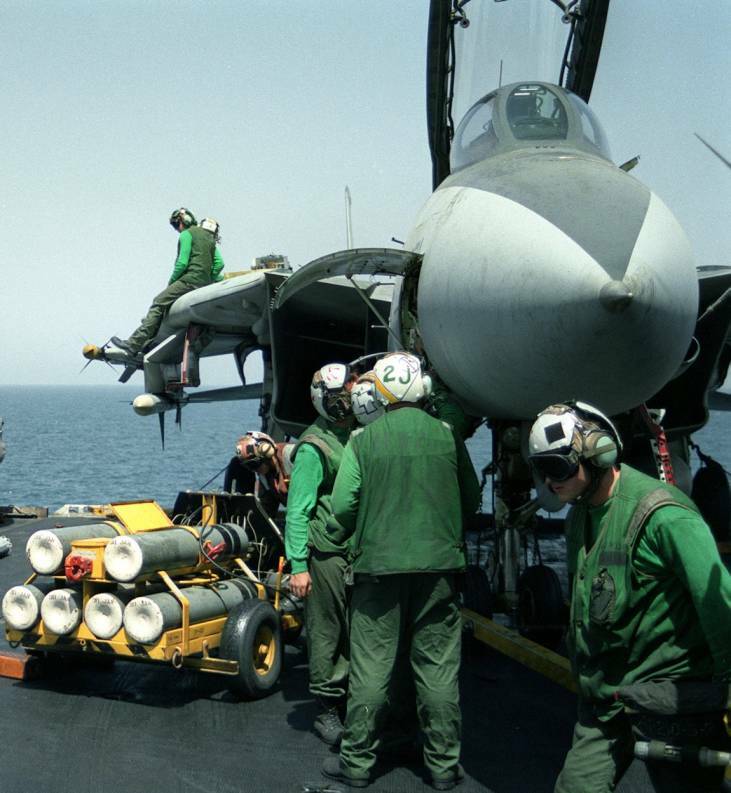 VF-21 arrived on station in the Persian Gulf on August 5, 1990 and was part of the Carrier Group that was America's "First Response" to Iraq's August 2, 1990 invasion of Kuwait. 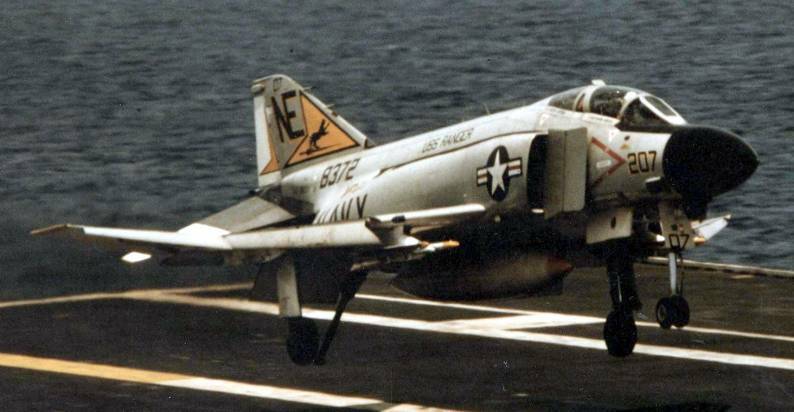 As Iraq prepared to cross over the Saudi border a 20-30 plane strike force launched from the USS Independence to stop Iraq's aggression. 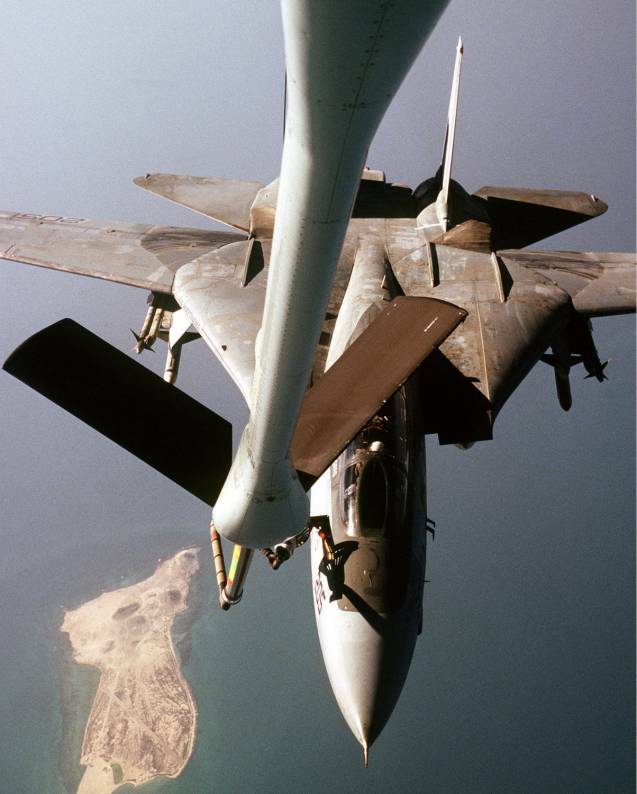 As a result the Iraq military stopped at the Saudi border. 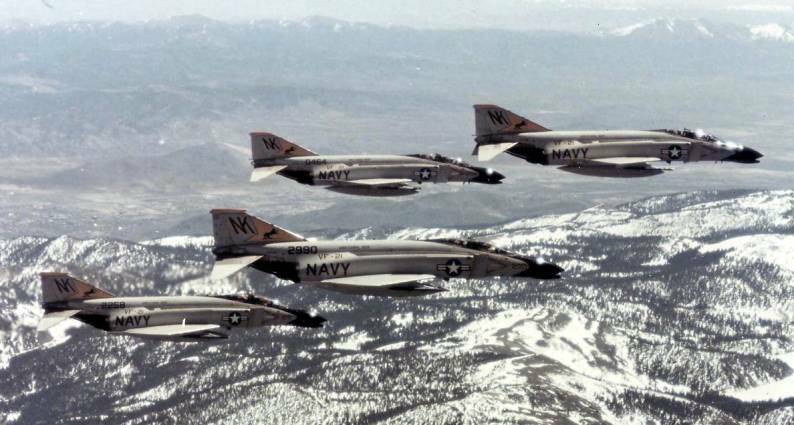 From here VF 21 maintained Combat Air Patrol "CAP" missions during the build up of the U.S. 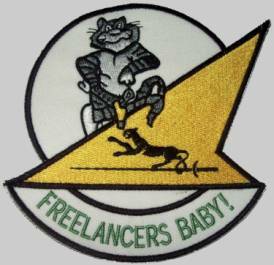 Forces to liberate Kuwait, this operation was known as "Desert Shield". 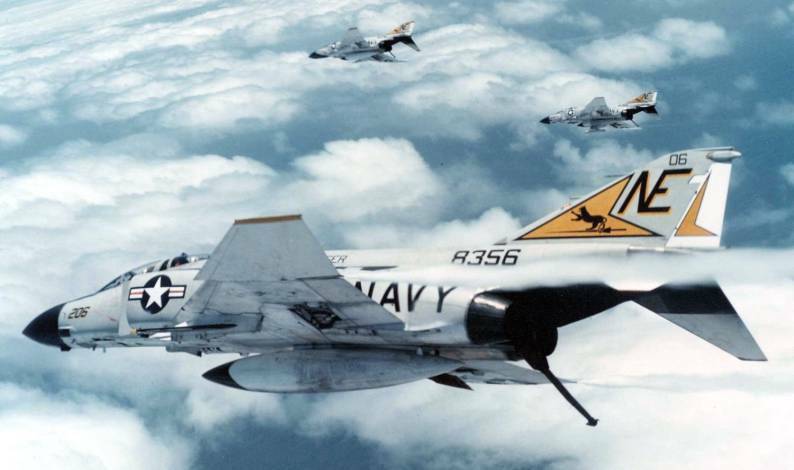 However, the squadron (part the USS Independence battle group) was relieved on station by the Ranger and Midway Carrier battle groups at the onset of "Desert Storm". 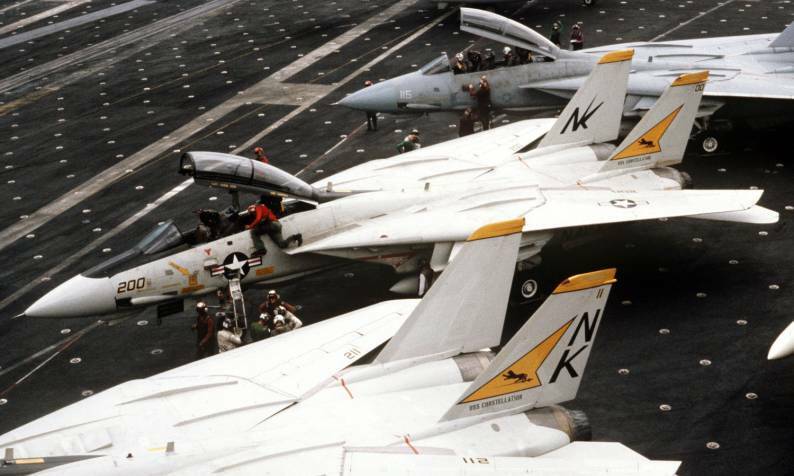 General Norman Schwarzkopf flew aboard the USS Independence to command the battle group; CBS Anchor Dan Rather reported from the USS Independence Flight Deck. 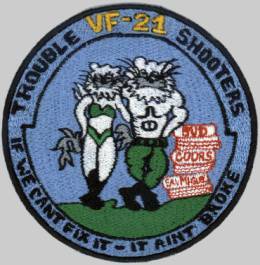 VF 21 returned aboard the USS Independence to establish "Operation Southern Watch" immediately after Desert Storm. 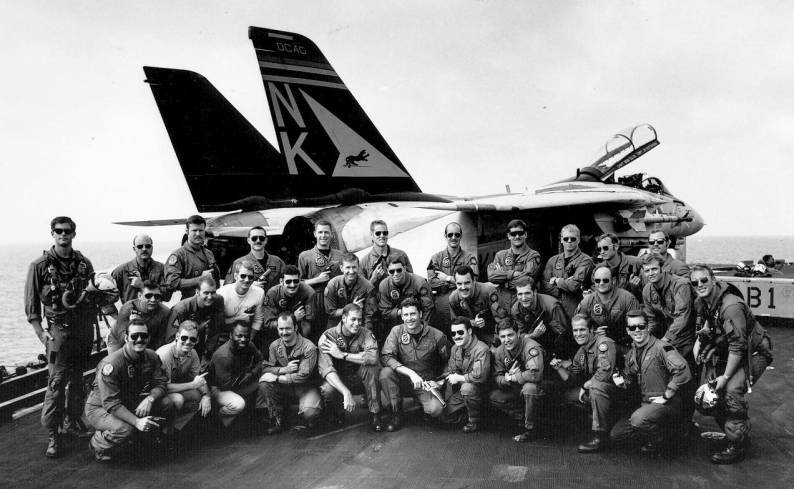 In August 1991 the squadron moved to Japan, when USS Independence took over the role of USS Midway in being the only carrier home ported outside the USA, at Yokosuka. 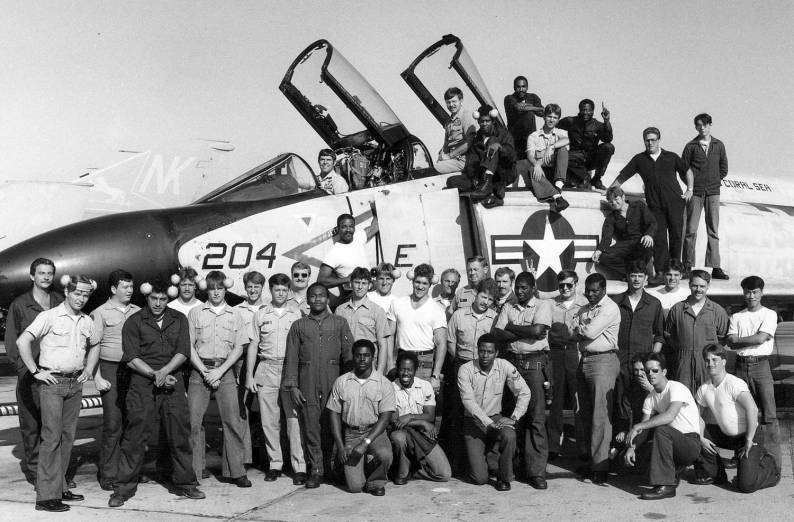 During this change the squadron stayed with the same carrier but moved air wings, from CVW-14 to CVW-5. 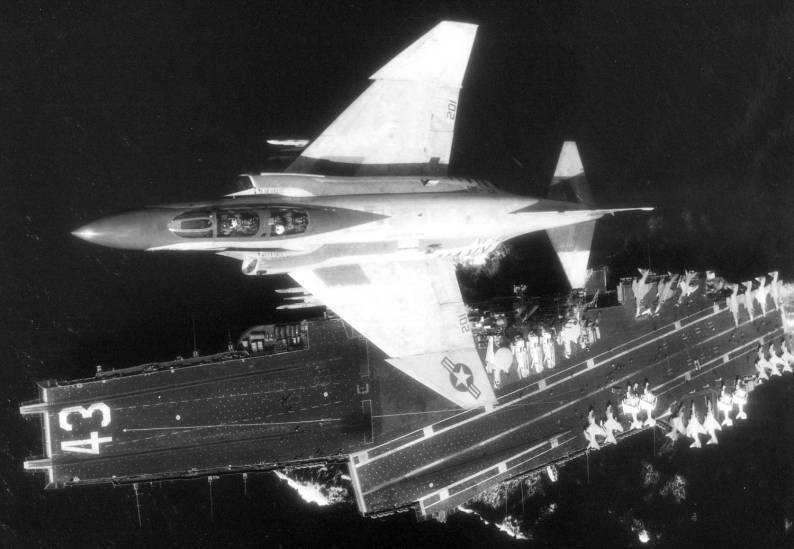 This was, because the Midway air wing had been without Tomcats, as the older ship could not accommodate the F-14's size and weight. 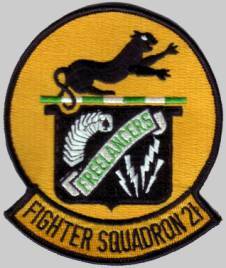 During the whole VF-21’s F-14 career, VF-21 has been partnered by VF-154. 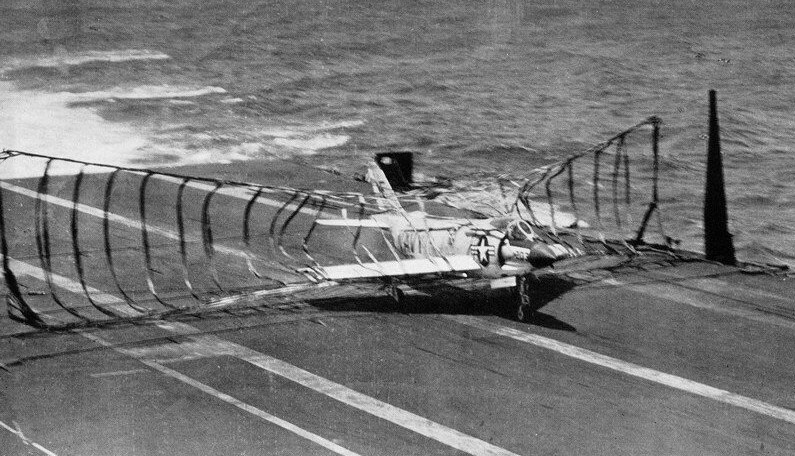 The last cruise of the Independence was not without incident or tension. 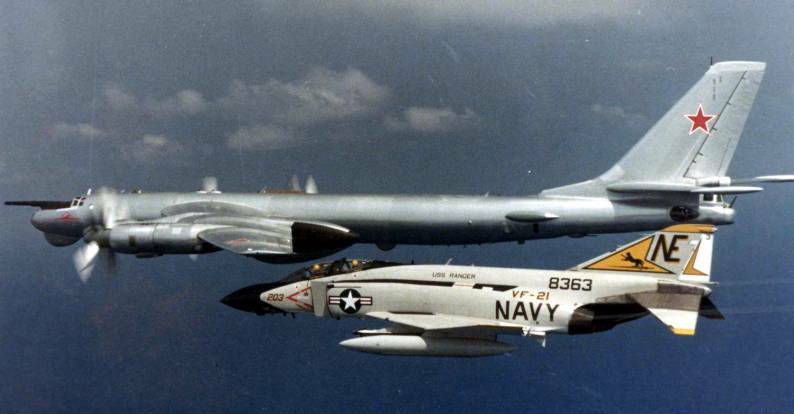 Along with the USS Nimitz (CVN-68), Independence and her air wing were involved in operations to demonstrate US resolve in support of Taiwan. 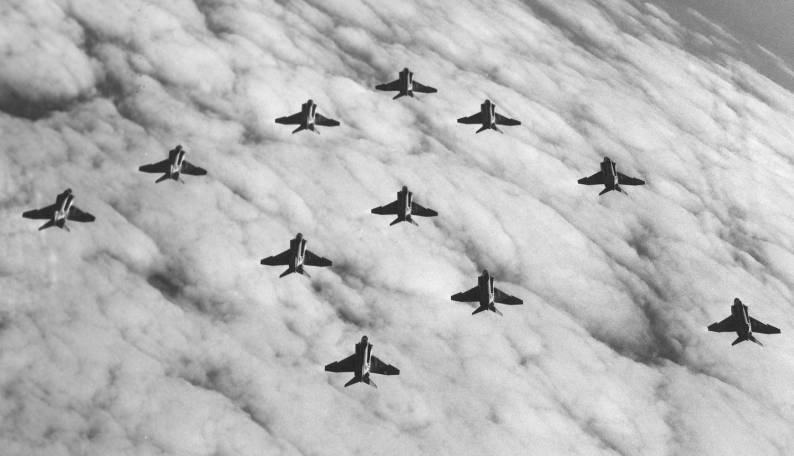 The 1995 Chinese military exercises once raised tension in the region and signaled China's opposition to Taiwans' Presidential Election. 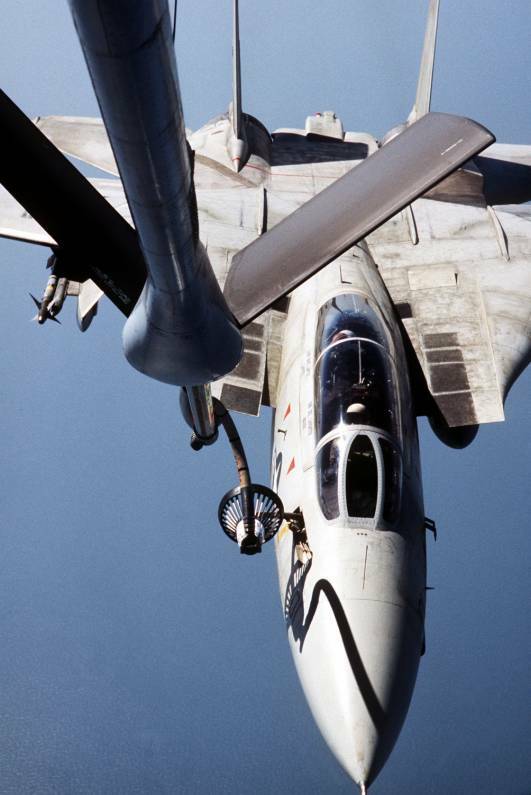 VF-21 returned from deployment on board the Independence in late 1995. 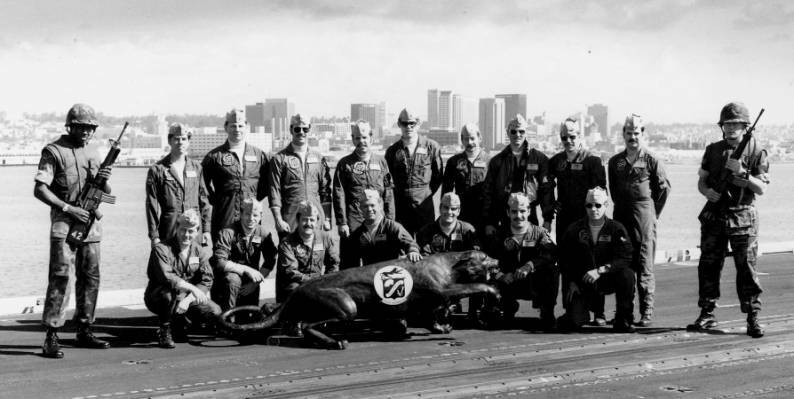 Unfortunately this was their last at sea period and the squadron was soon after disestablished, the official ceremony was on the January 31, 1996.